* Birmingham 2013 * by Richard Duke Richard's got the complete scoop on the Xojo Conference in Birmingham, England last November. * Window Tricks * by Sam Rowlands Sam shows how to get Mac OS to manage a window menu for you, save and restore window positions, add a document icon proxy, and much more. * Reporting Valentina * by Paul Budd Paul gives you step-by-step instructions on using Valentina Reports with Xojo. 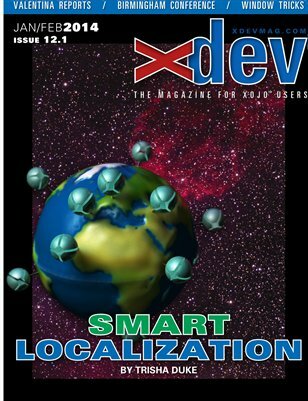 * Smart Localization * by Trisha Duke Localization might seem like something you add last-minute to your application, but it's really something you need to carefully plan. Plus: event-driven programming, tips and tricks, database structure, using AddHandler, RegEx, and much more! Subscriptions can be purchased on the xDev website.